The years 1943-1945 marked a reversal in the military fortunes of Germany, beginning with the huge defeat suffered by the 6th Army at Stalingrad on 2 February 1943. This volume, the second in the ‘Soldat' series, traces the lives and fate of the German soldier during this time period. Unfortunately, due to sales rights restrictions, we cannot offer 6513 Soldat (2) for sale in your country. The years 1943-1945 marked a reversal in the military fortunes of Germany, beginning with the huge defeat suffered by the 6th Army at Stalingrad on 2 February 1943. This volume, the second in the ‘Soldat’ series, traces the lives and fate of the German soldier during this time period. The scope of the book is confined to the Eastern Front, which produced more casualties than all the other fronts combined. Since the topic of the book is the ‘Landser’, it is naturally filled with period photos of Wehrmacht soldiers. These photos are inspiring too - soldiers appear in spring, in summer, in autumn, and in grueling winter settings. Their typical weapons and personal equipment are on full display, as are their uniforms. Pertinent points are highlighted in the photo captions, apprising the reader of a wide variety of topics. The writer is a well-published authority on WWII Germany, so the details are authoritative and informative. All photos are black and white, but are of a good quality so that they yield interesting details, including the many close-ups of soldiers. The photos are accompanied by four color plates produced by Stephen Andrew, which indicate accurate colours and uniform details. Each plate has its own detailed explanation, which will be of great use to the figure modeller and military enthusiast alike. The book's introduction is particularly useful, offering a description of how units were organized from 1943-1945, from the divisional level right down to the rifle company level. There is also a helpful section on which weapons, and in what quantities, were allocated to units. 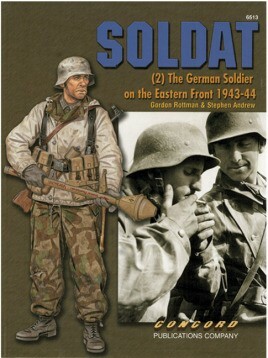 This is a welcome companion volume to the earlier ‘Soldat’ book, completing an in-depth look at the soldiers of the Wehrmacht as they fought against all the odds on the Eastern Front in the second half of the war.